The third period of North American history, after the Archaic period, is the Woodland period. What happened in the Archaic period? The Early Woodland period began in the southern and midwestern part of North America about 1200 BC. People like the Pueblo people settled down more in permanent villages and towns. More and more people used pottery for their containers in addition to baskets. During this time, while some people were still using spears and atlatls to hunt with, most people were switching over to the more modern bows and arrows. Where did bows and arrows come from? And a lot of people began planting and harvesting crops – farming – around this time. 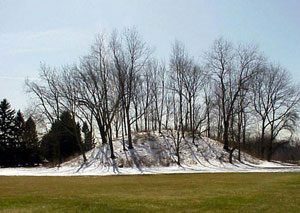 About 700 BC, Adena people began to build earth mounds. The time of this change depended on where you lived. So the Blackfoot, far to the north, did not enter the Woodland period and start using pottery and bows and arrows until about 200 BC. In the Middle Woodland period, about 400 BC, some Native people began to live in bigger towns and build bigger earth burial mounds for their leaders. Most of these people lived along the Mississippi valley and other places near there. They lived in the middle of North America. One of these cultures is called the Hopewell culture. 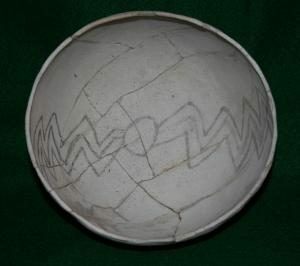 In the Late Woodland period, beginning about 500 AD, something seems to have happened to the Hopewell culture, and people stopped building new earth mounds and stopped trading up and down the rivers. Villages and towns got smaller. On the other hand, more people began using bows and arrows, and even though the villages are smaller there are more of them. More people were relying on farming corn and beans for their food. People were also growing tobacco. Where did beans come from? What was the tobacco for? Cite this page: Carr, K.E. Woodland period Native American history. Quatr.us Study Guides, August 10, 2017. Web. April 23, 2019. Sorry you didn’t find what you were looking for, Owen! If you ask your questions here, I’ll try to answer them.